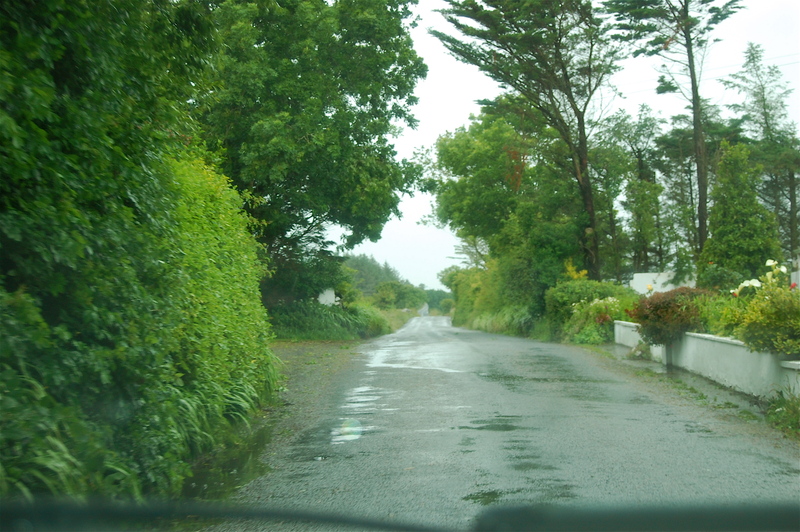 Rain in Ireland, not Milwaukee. It’s raining everywhere! – Emotional power can be intensified by the setting. A climax can be set in a high place, symbolizing a high point in the story. – The length of the scene is important. Ideally, it should include some twists, surprises, and be long enough to add suspense, tension and emotion. – The confrontation should be between protagonist and antagonist – not some minor characters, to make the most of the scene. These seemed like basic, obvious, wise words, but it was good for me to itemize them and then look at the various mini-climax scenes in my manuscript. One scene in particular stood out as being a wee bit lackluster, so I focused on that. I took this specific scene and thought about word choice, too. A post on the WOW – Women on Writing Blog, had me thinking about adjectives and adverbs: Monday, July 07, 2008 – Annoying or Awesome? Adjectives and Adverbs. – Writers should avoid extra adjectives. We think they serve a purpose, but many writers use adjectives liberally. Let your nouns carry the burden, saving adjectives for moments when emphasis is appropriate. – Omit adjectives if the noun implies the meaning. – If an adverb implies the same meaning as the verb, omit the adverb. We understand an adverb can emphasize the meaning of a verb, so this is a subjective edit. It might be necessary to replace the verb with a stronger verb before removing the adverb. – The three most common adverbs in English are: not, very, and too. We suggest writers avoid all three, but sometimes no other words will do. I went back and took a peek at Bonnie Trenga’s The Curious Case of the Misplaced Modifier (my favorite grammar rules book). Now I was worried… was I being an adjective pig? I wasn’t too worried about adverbs, but I do adore adjectives. I went back through the scene and highlighted the adjectives and adverbs. Oh, oh. Was I an adverb pig, too? I changed a few things, but there were still quite a few highlighted words. Were there too many? I just couldn’t judge. Where is a writing teacher when you need one? Oh, I am a writing teacher. So why is this so hard? Grrrrrrrrrrrrrrrrrr. The scene itself: it just so happens to be set on a mountain, so I have the “height” for a climax. Is the scene long enough, with twists and turns? Well, there are literally twists and turns, as the protagonist skis down the side of an erupting volcano. It feels tense to me. What do you think? The confrontation between protagonist and antagonist: we never see the antagonist, but there is definitely a dangerous confrontation. I have posted this scene for your advice. Is it cleaned up enough? Or are there still too many unnecessary no-no’s? Do I need to strengthen the verbs and get rid of more adverbs? What about adjectives? Too many? Can the nouns stand alone? The scene follows. Please tell me what you think. Your general opinion and thoughts, and/or ideas addressing the above mentioned concerns would be much appreciated. Once I had finished my coffee, I packed up again. Continuing onward and upward, I finally came to a vast expanse of snow that peaked in the middle, steam rising from a slight cone. Our guide had mentioned the frequency of Mt. Hekla’s eruptions, but he hadn’t seriously indicated that it might go off today. I set off across the broad field of white towards the steaming cone. The wind began to whip up the brittle snow, and it circled around me furiously. Relentless flakes suddenly and inexplicably started to fall. In an instant, the sky went from blue to cloud covered, and it glowered closely above. The tiny crystals pelted the small bit of skin exposed on my face. I stopped and pulled my neck gator up higher over my mouth and nose. Then I pulled down the goggles that had been sitting on the top of my head. Fortunately, they were clear plastic, because the midday sun was now obscured, and would soon be setting. The wind continued to pick up until the snow was attacking me horizontally. I decided the best bet would be to follow the trail I came up on, back down; steep, but also the shortest. Skiing down would be infinitely easier than skiing up had been. I pushed hard with the poles along the trail, which was quickly becoming obliterated. I reached the first black outcrop of rock, and heard a rumble. Actually, I could feel it with my feet. Was a lava flow soon to follow? Then there was a sharper noise. A loud “crack.” This didn’t sound like it had anything to do with the volcano; it was a much higher noise and I didn’t feel it through my feet like the rumble that had preceded it. Then the crack came again, and a splinter of rock flew over my head. Then “crack,” and another splinter, closer. Oh for God’s sake, was someone shooting at me? Here, on the top of a volcano in Iceland? And I thought nothing could surprise me at this point. Another splinter of volcanic rock hit the lens of my goggles. I came out of my stupor. There was no need to search. I knew the shots had to be coming from directly across, where there was another jumble of uncloaked, black lava. My first thought was where is my rifle when I need it? Then my nervous system lurched into overdrive. I pushed off and began threading my way down the path, flanked by the dark, pitted stones of long ago eruptions. I knew another exposed sweep of snow lay ahead, past the next turn. I hoped the person having target practice didn’t have a route as easy to navigate as mine was. I decided not to stop and look, but to just fly out across the unprotected, crystalline plain. The wind would be whipping the snow even more in that unsheltered area, and I just had to hope it would provide me with enough cover. I pressed the edge of my ski into the snow, took the corner quite fast, and came out into the open, tucked low. When I was away from the protection of the rocks, the wind didn’t howl, but it picked up in velocity. I couldn’t even see the other edge of the field, but I remembered I had to veer a little to my right to round the corner of the mountainside, and then I would be in the protection of another outcrop of the rock. It had taken me a couple hours to get up this high, so it was going to take me a while to get back down to the hut. The snow was blowing furiously, but I figured if it were difficult for me to see, the person targeting me would have an equally difficult time aiming at me. Flying over a few moguls, I caught some air in between as I crossed the wide stretch. I would have felt exhilarated in circumstances that were more agreeable. I reached the next pile of rock and collapsed against its far side. Was my pursuer matching my stride on the other edge of the mountain face? I peeked out around the corner, but couldn’t see anything but a dark rock formation, perhaps twenty yards away, across the expanse of snow. Another shot ricocheted off the rock above me. Bejesus, how could the bullet hit above me? That meant the person wasn’t across from me anymore. I was now a clear target because they were directly behind me. I gripped my poles again and pushed off. If I were moving, he would have to keep moving in order to keep me within sight. He couldn’t shoot at me if he were skiing. At least it didn’t seem likely, unless it was James Bond back there. I really wanted to know who this was. A man? A woman? Another wide field of powder. The good thing was the wind whipped up the snow out in the open. I would at least be less visible when I crossed it. The powder was deep now. I pushed hard, turned the next corner around another bit of hardened lava, and instead of heading down the mountain, I flew straight across the sheet of snow. I thrust with all my strength, and tucked my body down tight to my knees. I reached the opposite jumble of rocks in just a few seconds. Without waiting, I skied around it and started heading back up the hill. I was going to get above this person, and then I would ski down on top of them. Whoever it was would still be looking for me to be going down in front of them. It was quite a way to the next outcrop of rock that would be above where the shooter had to be. I just had to hope they wouldn’t notice me here, way over on their right. The snow was blowing hard enough so I hoped I was safe. When I reached cover, I stopped to catch my breath. Now I had to scan carefully and decide what route my nemesis was taking. Hopefully, I would be on the tracks of the shooter if I took the same path I had taken just a few minutes earlier, my first time down. I was dismayed to see the blowing snow had erased all tracks. It had seemed the shooter was directly behind me when the last bullets had whizzed past. No sign of anyone below me now. This person was a phantom. I kept as low as I could, moving slowly with the momentum of my weight and the height of the hill, so I wouldn’t have to pole. I scanned the hill in front of me, every stand of rocks, but saw nothing. Following the same route I had taken moments before, I came upon a sitzmark. The deep indent in the snow showed he – or she – had either fallen, or stopped and laid down to shoot at me. I continued on carefully, but didn’t see any movement ahead. I knew I had to be getting close to the bottom, and would have to face whether or not to enter the ski hut. It seemed like I had been skiing down the mountainside for hours and hours. My arms were aching and my knees were shaking, when suddenly the hut appeared. It was only fifteen feet in front of me; invisible in the blowing snow until I was almost on top of it. I snowplowed to slow down and skied around to the bench in front. Sitting down quickly to take off my skies, I was thankful the boots had a quick release. I knew the door to the hut was unlocked, and I stood with my ear glued to it, hoping I wouldn’t hear anything inside. I had to scan the area around me too, in case my friend slipped up behind me again. I held my breath, and with care opened the door. No one visible. I looked behind the door before quietly closing it. Breathe slow and deep Brigid, no time for a panic attack now; not a good idea given the situation. Why hadn’t I listened to Mickey when he warned me off this trip? This manuscript was incredibly important; to me, to women’s history, to the Icelandic people, but I wasn’t sure I wanted to give my life for it. Well, obviously I didn’t want to give my life for it, so I was just going to have to figure out what the hell was going on. I probably missed some, but you will catch them. Now I have noticed how many times I said was. Was is a no-no too……..
P.S. In my morning’s meanderings, I came across a comment/poem at BookEnds, posted by H.L. Dyer, and I just had to look up the source of the poem. School House Rocks, of course!! Lolly, Lolly, Lolly, get you’re adverbs here. Got a lot of lolly, jolly adverbs here. And so you see that it’s positively, very, very necessary. I thought you did a beautiful job describing the scene. I was cold when I got done reading it. I was nervous for the woman skiing down (but I didn’t realize it was a woman until you mentioned her name when she was talking to herself). They only thing I would point out is – it seems like there is a lot more red (adjective/adverbs) in the beginning, and less at the end. I like the Lolly song – I remember it from grade school! Your advice about adjectives and adverbs is very apt. Not only in high school english classes but in college english courses, the use of descriptive words is stressed more than anything. I often find myself overusing adjectives in my own writing, diluting the subject with excessive description. Thanks for the advice qugrainne, nice post as always. Hi Derek, haven’t heard from you in a while. Great to see you around again. I like the point you make about “diluting the subject with excessive description.” That is a perfect way to describe it. You are welcome for the advice, and thanks for saying nice things! Thanks for popping by my blog the oher day. Hmmm… it seems that this will be yet another one of those must-read-before-the day-finishes blogs. As if I had a 32-hour day (sometimes it feels like I do)! Rainy here in London, too. Like you, I just had a nice cup of coffee this morning, my son is practising his saxo upstairs, my wife and daughter have gone off to a ballet class for the younger one of the two and the skies are about to erupt in torrential rain any time soon. And the two photos of your post have made my day. I will have to come back and read the story thoroughly, I just had a sneaky skim-through this time. May I put a link to your blog on mine, please? Thanks for visiting, ACinL. I wish every day was 32 hours long, and I only needed an hour or two of sleep. Oh well. Of course, and thank you, for linking to my blog. I would also be pleased to hear any comments-advice on my adjective/adverb dilemma. It rained all night, but now the sun is out. Life is good. Congrats on winning the WOOF contest on at http://plotdog.com. It really makes our contest meaningful when we can combine things that instruct our readers along with great insight. Posts like this do so much to remind me that I am still learning. I tend to write from someplace in my head without even considering. I read this, see the impact and think that I need more knowledge. Thanks for the info and again, Congrats on the WOOF win! Thanks to PlotDog and Woof!! Hi. I’m glad to hear you enjoyed my book. It’s now out in paperback. I also thought I would let you know that I run a writing blog, sentencesleuth.blogspot.com, where I post the daily Criminal Sentence and blog about other writing topics. I hopped over the sentencesleuth.blogspot, Bonnie, and thoroughly enjoyed myself. Thanks for visiting here! I have recommended your excellent book to many, and I will be posting about your blog soon.